This blog has paid attention before to Islam Karimov. This dictator of Uzbekistan, who died in September 2016, used to boil oppositionists alive. 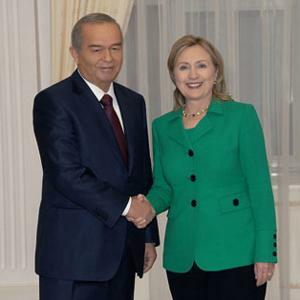 Nevertheless, when she was United States Secretary of State, Hillary Clinton considered Karimov her “friend”. This blog has also paid attention to the Dutch ING bank. Especially when the ING Bank raised CEO Ralph Hamers‘ salary by more than half this year to over 3 million euros. While rank and file ING workers received a a 1.7 percent increase; not enough to keep up with inflation.